Kerry Blue Terrier Temperament (Spirited, Affectionate, Strong Willed): Do You Have What It Takes To Own One? Bred as an all-around hunting dog and farm hand, the Kerry Blue Terrier temperament is affectionate, loyal, and strong-willed. Originating from Ireland’s County Kerry, the Kerry Blue Terrier would herd sheep and cattle, and hunt and retrieve small game and birds from water and land. Today, the Kerry Blue Terrier enjoys their time as a loyal family companion. Kerry Blue Terriers make excellent family dogs. They are good-natured with humans of all ages and love to participate in family activities. They are happiest when they are with their human pack. Kerry Blue Terriers make fantastic watchdogs. They will warn their family of any potential “intruders.” Though they aren’t known as nuisance barkers, when they do bark, they sound intimidating. The Kerry Blue Terrier adores children. Because they are sturdy, they don’t mind rough-housing. They aren’t known to get grumpy with kids, either. 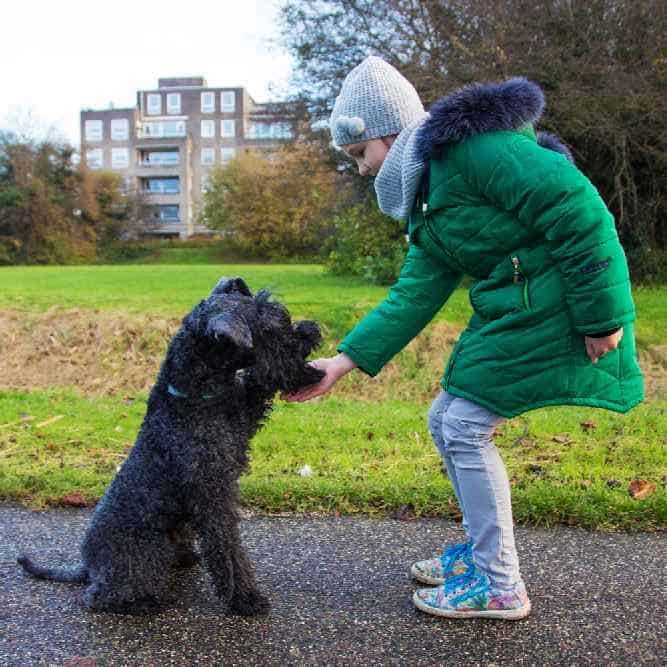 Kerry Blue Terriers may love children, but they aren’t the biggest fan of other dogs. In fact, they may become aggressive. But, with socialization and training, they can learn to tolerate other dogs. Don’t leave a Kerry Blue Terrier unsupervised around other dogs, though – even ones they do know. Their strong prey drive means Kerry Blue Terriers do not do well around small animals unless they are raised together and introduced properly. Still, do not leave them unattended with any other animal. Kerry Blue Terriers need room to run. They will do best in a home with a securely fenced backyard. Kerry Blue Terriers are strong-willed and respond best to an equally strong owner who shows consistent leadership. Therefore, they aren’t recommended for first time or inexperienced dog owners. Kerry Blue Terriers are extremely intelligent, but they are independent thinkers. The best way to train a Kerry Blue Terrier is by giving them a job to do. That could be daily training sessions or enrolling them in dog sports. Use positive reinforcement training methods filled with treats and praise to get the most out of your sessions. Kerry Blue Terriers tend to dig and chase – a common terrier trait. 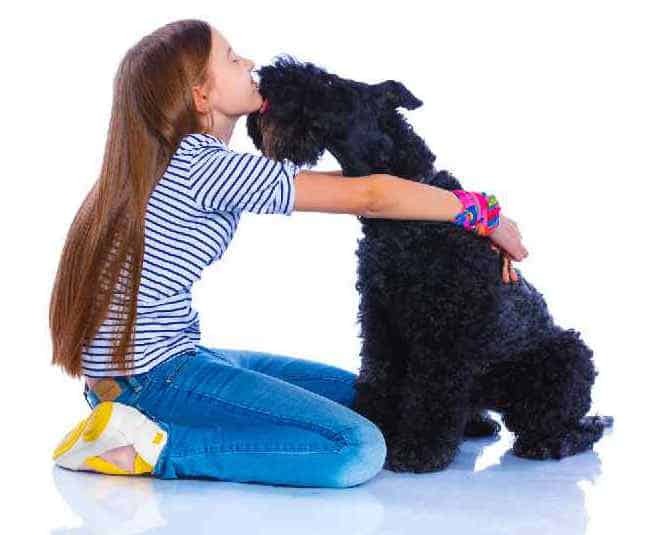 Start training your Kerry Blue Terrier puppy early to manage those behaviors. Ready to add this loyal and loving breed to your family? Now you must decide whether you want to add a puppy or adult to your pack. Kerry Blue Terrier puppies from a breeder are perfect for families who have enough time to devote to them. Keep in mind that puppies require a lot of work and patience, though. If you don’t have time to commit to raising a puppy, perhaps you should consider Kerry Blue Terrier adoption. Dogs in rescue organizations are typically adults, so they are perfect for busy families who don’t have time for a puppy. To find your perfect Kerry Blue Terrier, a great place to start is the Kerry Blue Terrier Club of America. They have both a breeder and rescue directory. Purebred Kerry Blue Terrier puppies for sale will cost between $500-$600. 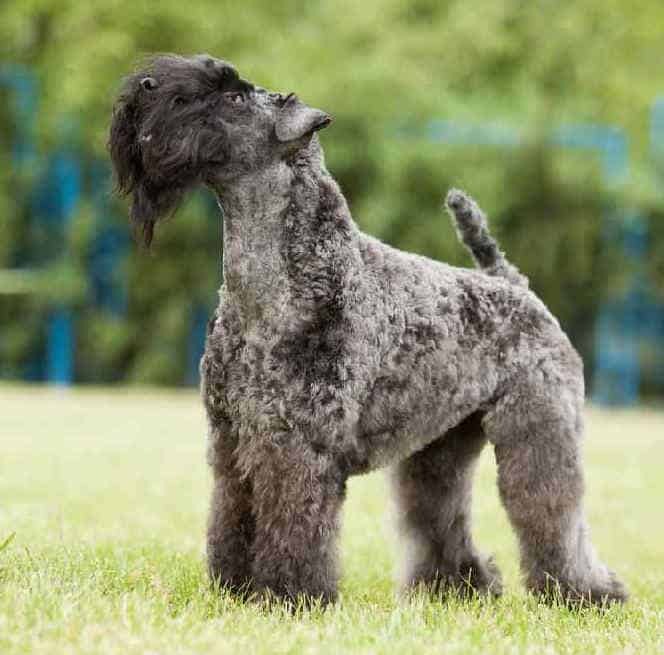 The Kerry Blue Terrier price depends on bloodline, breeder location, and litter availability. If you are on the hunt for a champion Kerry Blue Terrier, expect to pay closer to $600 or more. The Kerry Blue Terrier cost for adoption is between $250-$450 depends on the rescue organization and location. Decided to go the rescue route? The Kerry Blue Terrier Foundation is the perfect place to start. Some dog owners will purchase Kerry Blue Terriers without realizing their personality and temperament. So, they may bring them to a shelter to get rehomed. Kerry Blue Terrier rescue is a great option for those looking for an adult dog or even a Kerry Blue Terrier mix. Reach out to your local shelter to inquire if they have any Kerry Blue Terrier mixes available for adoption. If you prefer buying a Kerry Blue Terrier for sale from a breeder, your first stop should be the AKC Marketplace. Find some breeders in your location based on the type of dog you’d like (gender, bloodline, etc.) and plan some visits. 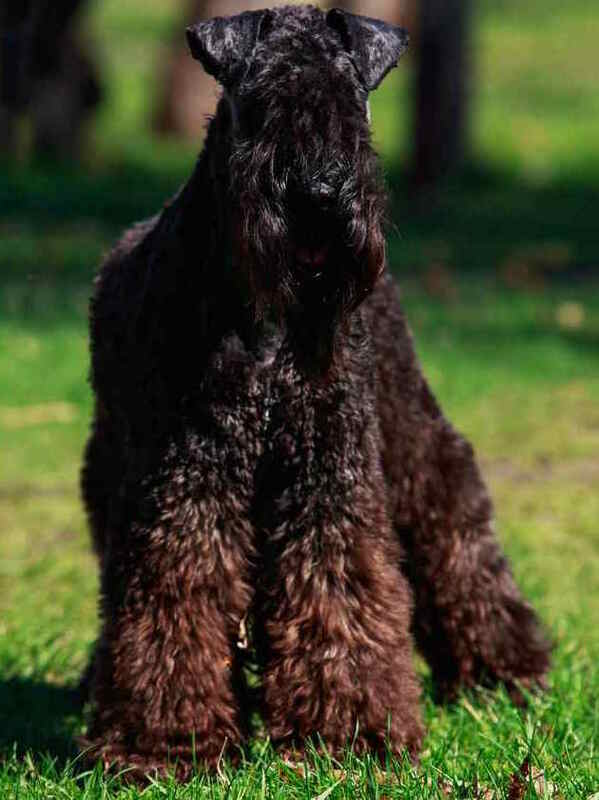 Kerry Blue Terriers have a wavy, soft, and dense coat. They are considered a non-shedding breed, but Kerry Blue Terrier grooming is high maintenance. They require daily brushing as well as trimming and bathes every four to six weeks. Some owners opt for professional groomer services for trimming. But, because they are an uncommon breed, it can be difficult to find qualified Kerry Blue Terrier groomers. The Kerry Blue Foundation site has a list of experienced groomers. Note: Your Kerry Blue Terrier's health should be the top priority. The Ultimate Guide to Dog Health is a handy guide that will help you recognize the symptoms of the health problems above. Get the knowledge to stay ahead of these terrible issues that can rob your lovely Kerry Terrier from vigor and life. Help your friend live a full life free from pain and suffering. While the Kerry Blue Terrier is moderately active, they also enjoy hanging out with their owner on the couch. They do need daily exercise in the form of walks, jogs, or games of fetch in the backyard. Kerry Blue Terriers love to be with their humans above all, so they will enjoy any activity you are doing. They also excel in dog sports like herding, obedience, and dock diving. Conclusion: Why the Kerry Blue Terrier? The affectionate, spirited, and gentle Kerry Blue Terrier is a devoted and loyal family companion. They get along great with children – even being tolerant of rough-housing and playtime. While they can be dog selective, if raised with them, they will be tolerant of other dogs. Watch them around smaller animals, though, as they have a strong prey drive. Kerry Blue Terriers are great for active families and genuinely enjoy spending time with their humans. If you’re looking for a strong-willed yet gentle breed, the Kerry Blue Terrier is for you. Previous post: Wire Fox Terrier Temperament (Quick, Bold & Fearless): Can You Handle It?